"Nan Tang" and "Nan T'ang" redirect here. For other uses, see Nan Tang (disambiguation). • Renamed from "Qi" to "Tang"
• Renamed from "Tang" to "Jiangnan"
A Literary Garden, by Zhou Wenju, Southern Tang era. Li Bian was an orphan who was adopted by the Wu prince Yang Xingmi. He was then adopted by Xu Wen, the Prime Minister of Wu and was renamed Xu Zhigao. Upon Xu Wen's death, he took over power in Wu, and was made a prince of Qi. In 937 he proclaimed himself emperor. In 940, he changed his name to Li Bian and renamed the state Tang (history would refer to it as Southern Tang). Thus, the Southern Tang began as an empire, however under Li Jing, after 959 and the defeat of the Southern Tang by the Later Zhou, it was no longer diplomatically possible to claim the title of emperor in facing other states, thus he assumed the title of king. The state was at first relatively large and prosperous compared to the other Ten States of that period. Li Bian's rule was comparatively stable and prosperous. Li Jing took over when his father Li Bian died in 943. The Southern Tang was able to expand its holdings far beyond those of its Wu Kingdom predecessor. It took advantage of a rebellion in the Empire of Min when the northwest revolted and set up the Kingdom of Yin. Min appealed for help, but instead of helping, the Southern Tang absorbed parts of the rebellious territory into its own. Then, by 945, the Southern Tang completed its conquest of the Min Kingdom and absorbed it into its own boundaries. As with the Min, the Southern Tang was able to take advantage of internal squabbles within Chu to expand its territory even further. The Southern Tang sent in an army in 951 and removed the ruling family to their own capital in Nanjing, and annexed the territory. However, Li Jing suffered a setback from the Later Zhou between 956 and 958, and ceded all of its land north of the Yangtze River. 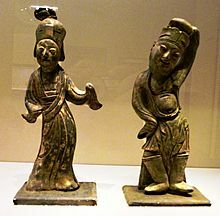 Li Jing became a vassal of the Later Zhou. The last ruler, Li Yu (Li Houzhu), took over the state upon the death of his father in 961. The Song dynasty had conquered the northern part of the state located in Huainan, and thus Li Yu reigned no longer as an emperor but as the Ruler of the State of Jiangnan (Jiangnan guozhu 江南國主). Li Yu managed to maintain a semi-independent status of vassal of the Song but had to finally surrender after fighting for almost a year in 975. He was taken to the Song capital in Kaifeng where he offered his formal surrender to the Song emperor in early 976. A Tangguo Tongbao (唐國通寶) cash coin with its inscription written in regular script. It is possible that Xu Zhigao cast a cash coin with the inscription Daqi Tongbao (大唐通寶) while the state still had its original name of Great Qi though the cash coins of preceding dynasties were still strong in circulation, under the reign of Li Jing cash coins were produced with the inscriptions Baoda Yuanbao (保大元寶), Yongtong Quanhuo (永通泉貨), Datang Tongbao (大唐通寶), and Tangguo Tongbao (唐國通寶). The latter two series were produced as "matched coins" where the same inscription was used but different fonts of Chinese calligraphy were used simultaneously while these cash coins all retained the same sizes and weights. Under Li Yu cash coins were cast with the inscription Kaiyuan Tongbao (開元通寶) was used in clerical and seal scripts and was based on a Tang dynasty era cash coin of the same inscription. ^ Hartill, David (September 22, 2005). Cast Chinese Coins. Trafford, United Kingdom: Trafford Publishing. ISBN 978-1412054669. Pages 119–120. ^ "Chinese coins – 中國錢幣". Gary Ashkenazy / גארי אשכנזי (Primaltrek – a journey through Chinese culture). 16 November 2016. Retrieved 16 September 2018. ^ "Chinese Cast Coins - SOUTHERN T'ANG DYNASTY AD 937-978". By Robert Kokotailo (Calgary Coin & Antique Gallery – Chinese Cast Coins). 2018. Retrieved 16 September 2018. Kurz, Johannes L. (2011). China's Southern Tang Dynasty (937-976). Routledge. ISBN 9780415454964. Mote, F.W. (1999). Imperial China (900-1800). Harvard University Press. pp. 14–16. ISBN 0674012127. Wu, John C. H. (1972). The Four Seasons of Tang Poetry. Charles E.Tuttle. ISBN 978-0804801973.